The days are getting so easy now, it’s almost embarrassing. From Saratoga to Lake George is 25 ½ miles. The road is scenic and country through places liked Wilton and Moreau, the shoulder on Route 9 is nice and wide and paved. Getting out of Saratoga was a little slow, at one point we had to ride on a busy part of Route 9 with no shoulder and a sign that said “No Pedestrian No Bicycles,” but that was short and once past that it was smooth sailing. After 18 miles we found a diner for breakfast. There was a 17 year old waitress who fell in love with Mikey, and wanted to run away and live on the beach with him. Me and Rita were outside locking up the bikes and he went in first. By the time we got inside she was making a big fuss over Mikey. She was loud and every hick in the place was watching. He left a broken heart in every town. This is where the next Mrs. Michael Sica wannabe worked. Glen Falls had a bridge with construction that slowed us down, but the town is beautiful. 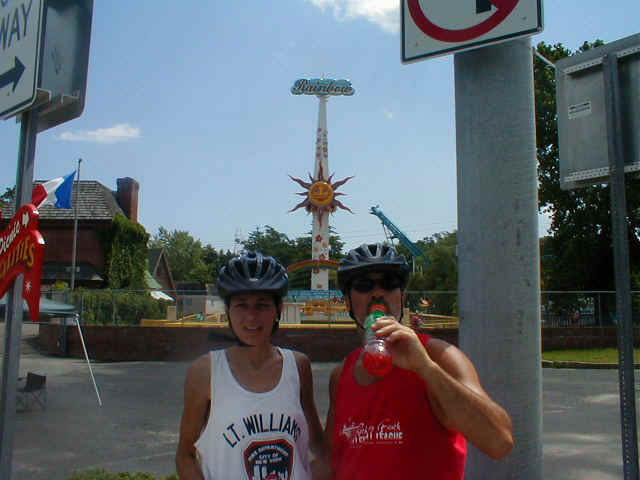 When we hit "The Great Escape" Amusement Park we were psyched because the only time we visit that place was when we go to Brant Lake so it felt like we were almost there. The Great Escape, so close we could taste it. We found a Super 8 Motel that had everything we needed. A pool, a Stewarts across the street for supplies, a good restaurant within walking distance, and most of all a T.V. that carried the Yankees showdown, with Pedro. 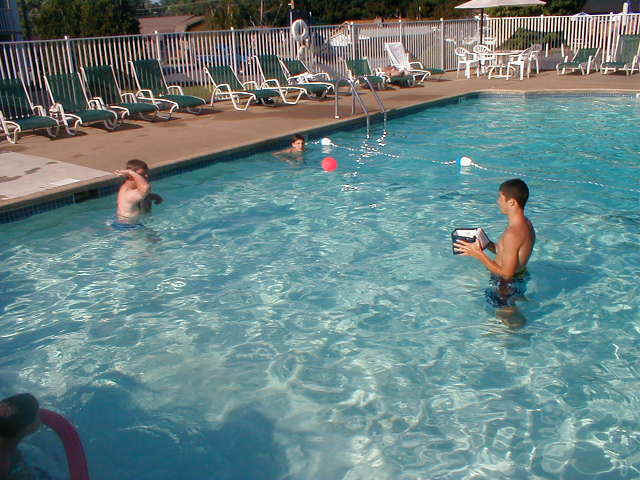 We spent most of the day in the pool, inventing games with a plastic ball we brought at Stewarts. We played golf, basketball, shark attack, etc. A long way from The Old Putt! We ordered pizza and played cards poolside. Dinner in some Smokehouse place was good and we got back to the room in time for the ending of the big game, with the Yankee-Sox tied 2-2 in the 7th inning. A perfect day.